This is a seminal work both in Manet's oeuvre and in the development of Impressionism, firstly because it deals with contempotary subject-matter, in particular that of bourgeois recreation, and secondly because of its very abbreviated manner of execution. 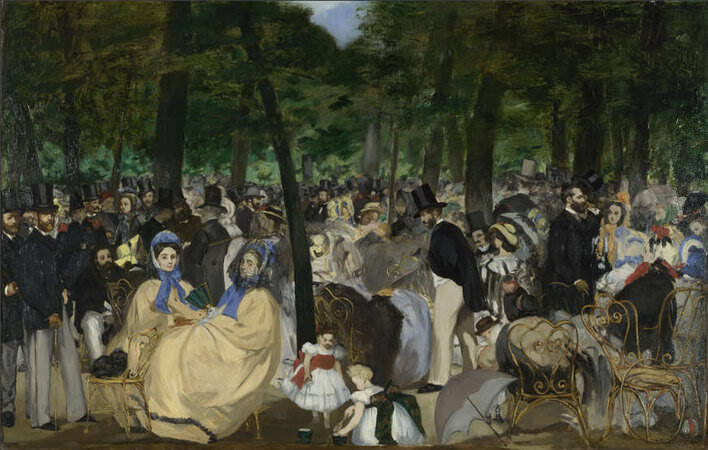 The Tuileries Gardens in Paris was the location for various events at which fashionable members of society gathered (Manet was himself of an haute bourgeois family). Music concerts essentially provided a pretext for socializing and thus most of the figures are here seen chatting. Though many are only loosely characterized, several of the figures can be identified. Manet himself stands on the futthest left and next to him is the painter Albert de Balleroy (1828-72), with whom he shared a studio. The bearded man seated near Balleroy and looking out is the critic Zacharie Astruc. Other figures include Eugene Manet, Manet's brother, in profile and bowing, the composer Jacques Offenbach to Eugene's right wearing pince-nez and with his back to a tree. The group gathered by a tree to Asttuc's left includes, nearest to Asttuc, the poet and critic Chatles Baudelaire, who had urged painters to take up themes from 'modern life'. As with others of his works, Manet drew on various sources for the composition. These include the numerous popular prints of the period, showing similar scenes at the Tuileries, and also a painting attributed to Diego Velazquez, of which Manet had made an engraving. The Spanish work shows a gathering of elegantly dressed men, including Velazquez himself and Murillo. Manet here depicted himself and Balleroy in similar positions to Velazquez and Murillo respectively, so implying that he is a worthy successor to Velazquez. Though based on sketches made on the spot, Manet painted the work itself in his studio. The daring style of execution is evident not only in the cursory treatment of the figures but in the broad, flat band of trees along the top. Whereas the women and children add to the color and variety of the scene, the men, all dressed in black and mostly standing, echo the tree trunks. Even the new, wroughtiron chairs, with their arabesque design, are made an integral feature of the composition. Exhibited at the Galerie Martinet in 1863, the painting caused a scandal, and was criticized both for its technique and coloring. Baudelaire himself seemed little impressed by the work, even though it ostensibly fulfilled his own prescriptions to artists.